Everybody loves to save time, in a society that is constantly looking to be productive and organised there are always tips and tricks to minimise the time we spend doing the tasks we need to get through each week. I am one of these people, even though I am not currently working I am always on the lookout for ways to be productive with the time I do have. I rarely get any time to myself and when I do it’s usually spent planning the next day, week ahead, on my blog, reading etc. I like to try and get as much done within that time as I possibly can otherwise it can be a good few days before I get any more time (toddlers are soooo demanding). Well I thought I would share with you some of my tips and tricks when it comes to planning productivity and my weekly task checklist to ensure I have those little things accounted for. When it comes to planning there are a few things which I like to do in advance. 1) Decoration – I always decorate 4 weeks at a time. I like to know that everything is ready to use as and when it maybe needed. 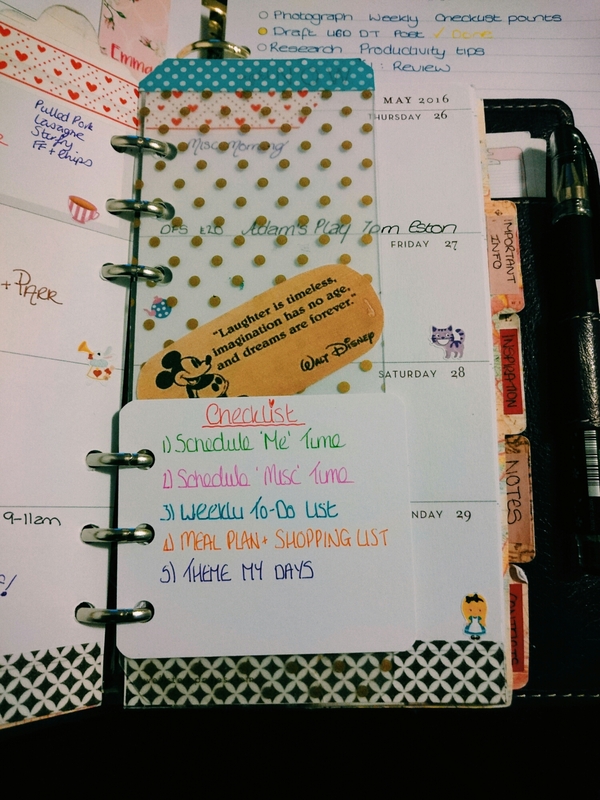 Some people may not like this as decorating weekly is part of their planning process however I leave my blog planner to do weekly but always pre-decorate my everyday. It’s one less thing for me to worry about. 2) Schedule Tasks – Once I have decorated my 4 weeks I then go through and add in any birthdays, appointments, calls, emails that are upcoming and I schedule in all my tasks such as laundry, rubbish, ironing, hoovering etc. I have a housework schedule that rarely differs week to week so it’s easy enough to do. 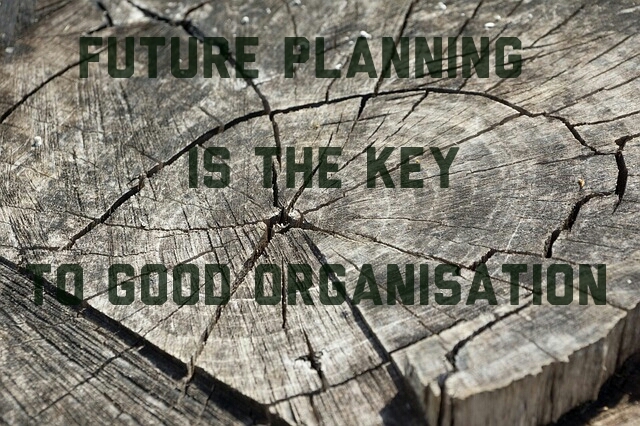 So there are my top top 3 future planning tips. Each week however I have checklist which I like to do through to ensure that some actions are taken care of but the days can differ week to week. 1) Scheduling ‘me’ time – I have to do this to ensure that I remember to look after myself. If I didn’t I’d end up doing housework or things for other people. I also use this time for blog planning, decorating and other planner goodness. 2) Schedule ‘miscellaneous’ time – This is just time where I plan not to plan. This for anything that may pop up that needs dealing with quickly that couldn’t be planned. This to to try and maximise productivity with my other tasks and minimise distractions. 3) Weekly To-Do List – This is pretty self explanatory. I list all the tasks I want done for the week and then prioritise the top 3-5 that are essential. 4) Menu Planning and Shopping List – I don’t plan my meals in advance for each day, instead what I do is write down 7 meals that I want for that week and just tick off which I have when I have them. That way I can be a bit more flexible with how I feel on that day. I also write a shopping list to correspond to what I need. 5) Theme My Days – This is an idea which was originally from Alexis over on Strange And Charmed and it’s very simple and rather brilliant. Plan your days tasks according to their category, for example; do all house work in the same day, all paperwork in the same day etc. This maximises your focus and makes productivity higher. There you have it, how I future plan and weekly plan. If you have any tips or tricks I’d love to know them. I am always looking for ways to improve my process. This is very similar to the way my planner is organised, the only difference is i dont have day sheets as i use a wo2p. I decorate 4 weeks ahead. Its interesting that our systms are so similar.